"I can’t begin to count the number of times parents have told me that my sports-themed books finally got their sons to read." 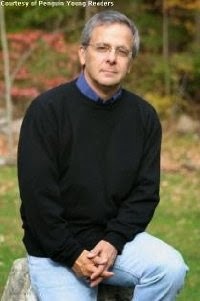 This quote, from bestselling author Mike Lupica, made me want to investigate. I can't believe I've been missing out for so long! Not only do they get right to the meat of what a lot of kids (boys AND girls) are into -- sports -- but they give us characters kids can relate to, ones that they can see in themselves. It's especially compelling when the authors themselves are professional athletes, making kids even more interested in reading a book by their favorite sports hero! Tim Green, a former defensive end with the Atlanta Falcons, kicked off my middle grade sports spree with a corker of a premise: a 12-year-old kid who can predict football plays. Troy is a good kid but not having a dad in his life weighs on him. He steals an official Atlanta Falcons football, which leads to him to meet Seth Holloway, the star of the team. When Seth realizes that Troy's football genius might help him finally win a championship ring, things click into place. If it were only that easy. A gruff coach thinks the Falcons would get a bad rep if something like this ever came into light. And Troy's mom doesn't want him to do it, because if he fails, it would cost her her job with the Falcons. Tons of barriers are thrown in front of Troy in this roller-coaster ride. This "sports book" genre is NOT just for boys. Alex Morgan, a gold-medalist Olympian with the U.S. soccer team, wrote a winner of a novel about a girls' soccer team. Now, I don't know much about soccer. 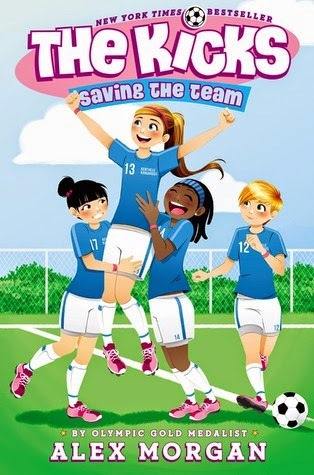 And a book about girls' soccer? I went in skeptical but was surprised at how much I enjoyed it. Devin is a 12-year old soccer phenom used to playing at a high level. She moves to a little California town with a horrible soccer team, and being with these underachieving goofs is aggravating at first. But Devin starts to realize that maybe everyone has their own skills. Can she figure out how to turn around the Kentville Kangaroos by identifying and utilizing everyone's peculiar talent? Of course she can! Morgan does a great job writing about world of teen girls. Neat to see the eclectic cast figure out how to work together and win. Amar'e Stoudemire, power forward for the New York Knicks, has sold hundreds of thousands of copies in this series, and it's not hard to see why. Based on his own life, Stoudemire stars in this book as a little brother who likes basketball okay, but LOVES skateboarding. Amar'e's buds give him a hard time about not playing more ball, given how tall he is, but it's all in good fun. Things change when punks take over the local bball court. They leave garbage all over, disrespect everyone, and hog the court. There's only one way to get them to vacate: beat them at basketball. Amar'e must draw upon his bravery to help his friends take out the trash. Not only does this book do a great job of getting the reader hooked on these fun characters, but the play-by-play descriptions are really strong. And at only 144 short pages (along with a smaller than usual page size), it blows by quick, making for a fast and easy read. A good one to give reluctant readers a sense of accomplishment. Skateboarding. Romance for boys. Anything involving flaming dog poo! More sports! A few robots and super heroes with twist! I rest my case. Now, off to procure some dog poo. Thanks for the shout out! It all still holds true, but remember, you have to have something somewhat gross and definitely embarrassing happen with the dog poo. And then there are life lessons that have to be learned in a round about and not boring way through the dog poo. Very complicated, this MG lit.